When you are gunning to buy the cheapest available option on the market, you might find yourself wondering if there is such a thing as a good option. While it certainly might be true that you will not be able to buy the best guitar on the market for under 100, you might just find something useful, especially for a beginner. The Rogue RA-090 Dreadnought Acoustic guitar earns its name well, for it feels like you might as well be stealing a guitar for the price it is being sold at. While it is not a great guitar, it is definitely reasonable for the price. Let’s take a closer look. Let us talk about the shape of the guitar first: the Dreadnought. This design is one of my favorite for many reasons, the main one being that it is easily the best addition to any guitar. The size of it allows the player to project the sound with incredible power and adds depth to the lower end of the guitar’s tones. Though it is also a dangerous shape because it can make the guitar overly powerful, giving the sound a booming quality you do not want in your play. Here the dreadnought is used adequately, adding the meat onto the bones of the guitar’s sound. While not perfect, the shape is definitely viable. The top of the guitar is made out of whitewood, a nondescript type of hardwood that acts similarly to basswood in many ways. While there is very few specification as to what this whitewood is, it acts as a decent top wood, resonating well with the midtones . The back and sides of the guitar are made of the same material, keeping the resonance of the guitar in the mid tone range. The neck of the guitar is constructed of nato, which is sturdy enough and feels very smooth to the touch. The neck is slender and easy to reach around with your fingers, reaching the painted maple fretboard of the guitar with ease. While maple is not the most popular material for fingerboards, it is definitely not a bad one. The fretboard is smooth to the touch and a pleasure to play. The best part of the guitar’s body is it’s decoration. The buyer has several options, all of which are an appealing coloring for the guitar. Black, sunburst or white, the guitar is definitely a pretty sight. The bridge of the guitar is constructed of painted maple. This material is entirely neutral in its resonance. This means the material will not affect the sound in any way, being slightly flat in tone. Thankfully it is the bridge made of the tonewood, not the top, which means the sound will not be affected much. The nut and the saddle of the guitar are made of a synthetic material, possibly plastic. Quite an adequate choice for a guitar this cheap. Allows for little buzz on the guitar and relatively clean tone when playing. The tuners on this guitar are not the best. They have a tendency to not stay in tune for a long time. A little annoying to have to keep retuning it every few days, but nothing a beginner cannot learn to tolerate. If it does bother you, think about investing in new tuners. The sound of the guitar is something of a surprise coming from a guitar this cheap. While definitely something below stellar, the guitar still allows the player to get a bunch of good sound out of it. The lower end sounds, while being slightly muddy, are adequately boosted by the dreadnought body. This results in ok mid and lower end tones. The higher end tones of the guitar have a tendency to not be as expressive as you’d want them to, but are entirely adequate, considering the price. The sound is definitely something that a beginner will find use for, but graduation from this guitar is easy and will come fast for many beginner guitar players. The rule of thumb with guitars is that you get what you pay for. When you pay the bare minimum for an instrument, you will be getting the bare minimum out of it. 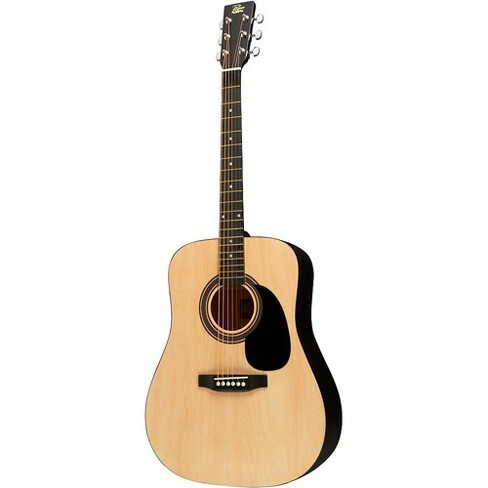 While there might be a number of instruments in this price range, most of them will not be able to compare to the Rogue RA-090 Dreadnought Acoustic guitar, with flatness of tone and tuning instability being a common plague among these. Don’t expect the guitar to last very long in terms of skill satisfaction though, as sooner rather than later, you will outgrow the sonic capabilities of this one.